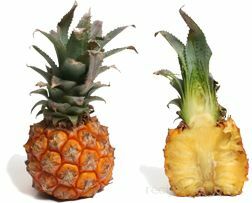 To peel a Pineapple, cut off the crown and the base, set upright and then with a sharp knife trim off the skin in strips, cutting from top to bottom. Remove any remaining brown eyes by cutting out with a knife. 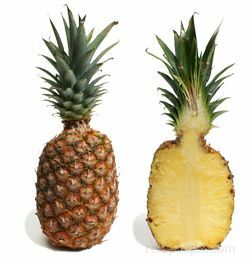 To cut Pineapple in half, use a sharp knife and cut from the top down to the bottom, through the middle. To quarter, cut each half in the same manner. Remove the core from each section and cut crosswise to slice into pieces. 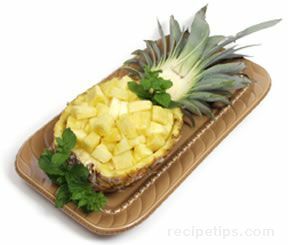 For round slices, cut the peeled Pineapple crosswise into slices and then remove the fiberous center core by cutting it out with a knife. 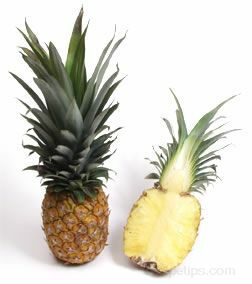 In addition to the larger, more tradional Pineapple, a smaller version is grown that only reaches a height of 5 to 6 inches when mature. 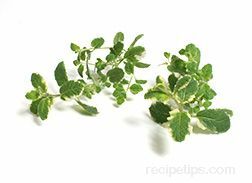 Known as a mini or baby pineapple, this fruit is grown for use as smaller version that provides the same sweet flavor of the standard Pineapple but with an edible core, unlike the the larger version.